Kaffir Lime leaves are widely used in Cambodian cooking. They are an essential ingredient in "Kroeung" and a must have garnish for Cambodian favorites such as “Amok” and Prahok Ktees. In traditional Cambodian chicken and lime soup (Sgow Chrouk Moan) the leaves are used whole and removed from the broth before serving. Their rich and pungent characteristics bring out the distinctive flavor and fragrance that Cambodian cuisine is known for. 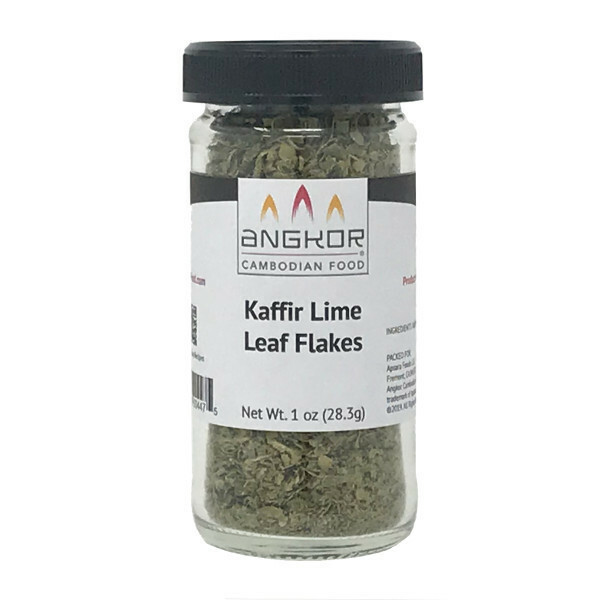 Dried kaffir lime leaf flakes are good in spice mixes and rubs, or sprinkle over sautéed meat dishes. 1 teaspoon of Kaffir Lime flakes is roughly equivalent to 2 teaspoons of fresh Kaffir lime leaves. Grown and processed in California.